With Mother’s day coming up this weekend, we’ve been thinking about all of the lovely mums we train with every day here at Elite and, in particular, all of the expectant and new mums that we work with. As an instructor, it is incredibly rewarding to be able to be a part of the journey of pregnancy and postpartum care, and to see the results achieved by our clients for a happy pregnancy and postpartum experience. Everyday we get questions from mums and expectant mums about how to stay fit during pregnancy or how to re-gain fitness safely post pregnancy, and there are so many reasons why pilates is the perfect practice for this. At Elite, we offer both pre-natal and post-natal care and here’s why you should consider looking in to it if you’re expecting a little one or if your baby has already arrived. 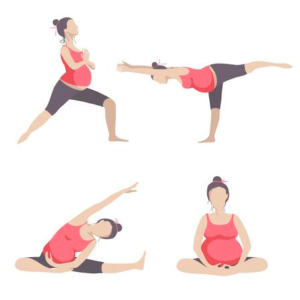 Why should I practice pre-natal Pilates? During pregnancy, your body is undergoing big changes (to say the least) and along with that comes certain stresses from back pain, pelvic pain, tight muscles and incontinence. Our pre-natal pilates classes are designed for pregnancies of 12+ weeks and focus on maintaining fitness, mobility and relieving pain. During pregnancy, our centre of gravity changes as our baby grows and as a result we can experience back and pelvic pain. Our pre-natal course has been designed to incorporate exercises which work to stabilise the pelvis and lower back as well as strengthening the deep abdominals which provide support for the spine and thereby reduce pain. It’s no secret that laughing care-free in pregnancy is not easily done, especially as your baby grows and seems to enjoy cosying up to your bladder! Pilates focuses on strengthening the pelvic floor to avoid incontinence and to have a healthy pelvic floor in preparation for childbirth. Why choose Pilates for post-natal care? Naturally, the first few weeks after having your baby are all about cuddles, changing, feeding, winding and (occasionally) sleeping, but after the blur of the first few weeks of new-parenthood its time to start thinking about taking care of yourself. The recommended time to get started is 6 weeks after giving birth vaginally or 8-12 weeks after a c-section, however you should always check with your GP before getting back into fitness. After having a baby, often we see clients who are eager to throw themselves back into gruelling fitness regimes and feel under pressure to “get their body back” (it didn’t evaporate, its just a little different). Our biggest piece of advice when getting back to fitness after giving birth is to start gently. Your body has gone through whole lot of change in producing a whole other human being, so cut it some slack! Here’s why pilates is a great option for post-natal fitness. As mentioned above, pilates places a huge focus on the pelvic floor, and for good reason. Our pelvic floor as a band of muscle that runs from the pubic bone to the coccyx and from sit-bone to sit-bone and it holds our bowel, bladder and uterus in place, and so before birth its important to strengthen this band of muscle, but after going through labour, these can be weakened and need our attention post-baby. Your midwife did tell you about your pelvic floor exercises too but in the newborn haze maybe you forgot about them? Pilates helps you to re-engage the pelvic floor to manage post-natal pelvic issues. Because of the weakening of the abdominals during pregnancy and the added weight of bump as well as changed centre of gravity, new mums can end up with some residual back pain after giving birth which it is important to address (especially as you’re carrying around a new baby!) For post natal care, we gently start to strengthen the abdominals, helping them to knit back together and starting to improve conditions such as diastasis rectis. Our classes target the weakened abdominals which have been stretched during pregnancy to start to re-build the deep muscles of the core steadily and safely before advancing. For all of our breast-feeding mammas, you’ll probably relate to this one! Feeding a hungry baby can cause tightness in the upper neck and shoulder area. In pilates, we work on opening the chest and stretching the shoulders to give you some much needed relief. At Elite Pilates, we do not run a specific post-natal class, however we do teach many post-natal clients in our Level 1 reformer classes. The reformer is an incredibly supportive piece of equipment which is perfect for post natal care. Sign up for our trial pack today and get 2 classes for €30! Now that the most anticipated tournament in European rugby is well underway and we are all embracing that 6 Nations buzz, many of us wait with bated breath while some of the worlds greatest players are going head to head to win the title, and the question arises once again as it does every year – which players are in the best physical shape and just how are they doing it?! As an infamously high-contact sport, the resilience of players must be almost bionic as enduring broken bones and torn ligaments, amongst a whole host of other ailments comes with the territory of being a professional player. Between tackles, mauls, rucks and line-outs over the course of a season, rugby is demanding on the body, to put it mildly. So how are some of the worlds most respected players working to stay injury free and match fit? You guessed it – reformer pilates! When we think of the biggest names in rugby, I think that its fair to say that most will imagine training sessions to include gruelling sessions lifting enormous weight, however how many of us have ever pictured Johnny Sexton trotting off to reformer pilates? 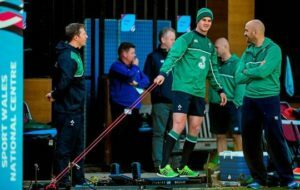 It isn’t just the man of the moment who has made reformer pilates a staple in his fitness program, but teams like Leinster, The London Irish and Warwickshire are all incorporating pilates into their training schedules and reaping the rewards. So why are our favourite rugby stars fawning over reformer? Pilates is the most effective way to promote spinal health and to develop the inner muscles of the core and neutral alignment of the spine while also developing strength and flexibility of the shoulder girdle and hips to provide extra support for the spine and therefore to decrease the risk of injury. Practicing pilates lengthens the muscles and as such prevents shortened muscles which are far more susceptible to pulls and tears and works to prevent injury before it occurs. The reformer uses the resistance of springs to give the whole body a full workout and retrains the smaller (local) muscle groups to provide better support and stability to take pressure off of larger muscle groups (global muscle) and improves performance by training the body to work uniformly for better speed and focus on the pitch and less time spent off as a result of injury. So if you’ve made it your resolution to up your game on the pitch this year and want to develop strength, co-ordination, flexibility and mobility, you might just want to make like a pro player and get on a reformer! Like it or loath it, Valentines Day comes but once a year and with it, lots of cheesy cards, candle lit dinners, chocolates and all of the rest. Loved up or not, we thought 2019 should be the year to shake things things up and embrace V-day in a new *cough* far superior *cough* way. Why not keep cupid on his toes, eh? 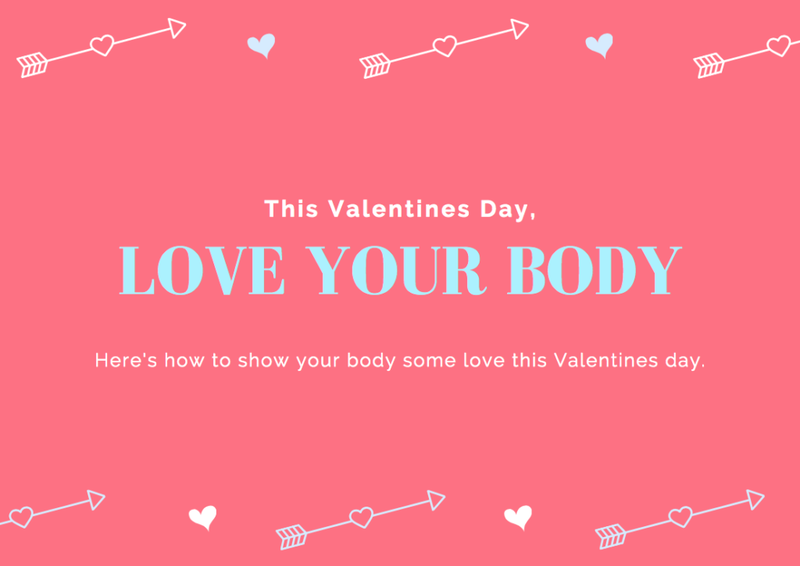 This year, we’ve decided to make Valentines all about loving your body. Have a think about it, how often do you compare yourself to others? How often do you beat yourself up about being to much of one thing, not enough of another? How often do you actually take the time to be nice to yourself, mind and body? I think it’s fair to say that pretty much all of us have fallen into this trap on occasion, so why don’t we dedicate this next week to just loving our own bodies for all they do for us? After all, it’s out body that allows us to go out and dance our socks off with our friends on a Saturday night, travel to all of the far away places we have on our ever growing bucket lists, take a stroll on the beach on a sunny day, play with our kids and so much more, isn’t it time we learned to appreciate it? At the end of the day, the longest relationship we will ever have is with our body. What says Valentine’s Day more than that?! 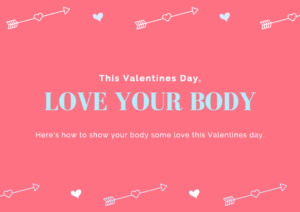 Here are a few ways that you can love your body this week. Simple as that. Whether you’re a complete fitness newbie or a seasoned pro moving your body every day and getting a bit of a sweat on is not only boosts our confidence and clears the mind, but it gives us a huge dose of those feel good hormones that are so important in improving our mood and our self esteem. Obviously, pilates is our one true love, as it really is accessible to everyone and provides a challenge at every fitness level, but choose whatever form of movement you love and get out and do it. Strength looks different on every body, so do what makes you feel good. The oldest trick in the book! A quick jog, a long walk whatever you fancy just get outdoors and breath in that fresh air! Yes, its February in Ireland, yes, its cold and mostly raining, but hey, thats what coats are for! According to medicaldaily.com “In a 2014 study at the University of Michigan, researchers found that group nature walks were associated with significantly lower depression, less perceived stress and enhanced mental well-being.” Need we say more? You heard us. So maybe you have some fancy dinner plans, go out and enjoy them! We all know when we’re eating things that aren’t great, we usually don’t feel great, but instead of getting caught up with calories and ‘bad’ or ‘good’ foods, think about providing your body with the nutrition that it needs to thrive. Eat to feel energised and satisfied and not as a punishment for the guilt you feel after a little indulgence on the 14th. Whatever way you prefer to relax, (although we highly recommend the above), block out a few hours for ‘me’ time. This is something we should probably practice more. With work, study, kids, parents and everything in between, we can often forget to tend to our own needs. It’s not selfish to take time to look after your own physical and mental wellbeing, and checking in with yourself is such an important part of this. If there’s one thing you do this week, make time for you. Yep. We’re all sick of hearing this one, but how many of us are actually taking heed? I could go one about blue light, sleep, attention span and all of the rest of it that you already know but I won’t. I will say, make even the smallest step towards reducing screen time, even if its just 30 minutes, and your body and mind will thank you for it. Now thats its November and we can finally mention the “C” word, a lot of our clients have been asking us how to get the most out of their training so that they can feel their best in time for the silly season. With party season fast approaching and colder weather tempting us to stay snuggled up inside, it’s all too easy to fall off the wagon, so we’ve come up with some of our favourite tips for staying on track while still having fun during the festivities. Set your goals for the week by scheduling time for you to move your body. We get it, its cold, your tired but committing to an appointment at a time you know you can make it in advance makes it a little easier to get up and go. Coming straight from work or working out right before work? Pack what you need for class the night before. The go-getter, night-before version of you will hold sleepy, next morning you accountable. Maybe the year ran away on you and you had intended on making this year your year to focus on health and fitness but it didn’t quite happen? Instead of waiting until January and then facing burnout by February, make the change now and finish 2018 on a high note. We’re currently offering 7 reformer classes to use over 30 days for €99. Why not grab it and start your pilates journey now? At Elite Pilates, we believe that pilates is for every Body and we’re on a mission to spread our passion for pilates across cork with our award winning studios in Carrigtwohill, Donnybrook & The Kingsley Hotel. Elite Pilates is Cork’s premier pilates brand specialising in reformer, barre and mat pilates. We understand that time is precious, which is why we operate a flexible timetable 7 days per week so that you can keep up your training at a time that suits you. We’re settling into September, the days are getting shorter, the coats are coming out and the school term has crept up on us all of a sudden. For many of us, September is almost like a mini “new year, new me” start… a fresh start to get back to reality and routine after the Summer madness. This is the beginning of a series focussing on nutrition for back to school.. suitable for the school-goers and also the grown-ups. Today’s topic is talking all things breakfast, and what a healthy breakfast is. Breakfast is essentially, breaking the fast. The first meal of the day which sets us up for the day, kick-starting our metabolism and giving our first dose of fuel. Think of your body like a car, you wouldn’t go for a drive without some fuel in the tank, would you? The same thing for the body. We all need a good breakfast to get us going. 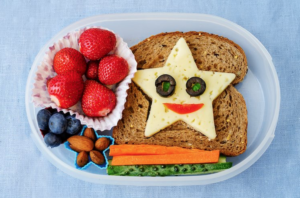 Firstly, there is no such thing as the perfect breakfast, but there are numerous options we can choose from, whether you or your child is a nibbler or a bottomless pit in the mornings! Next, your colourful addition, which is generally fruit or berries in the morning, but equally any vegetables too. Chopping banana, heating some frozen berries, slicing some avocado are all options to add to your base to get some extra nutrients. 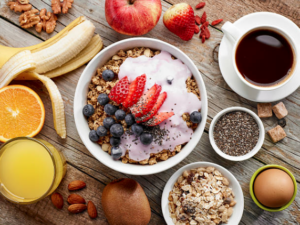 Depending on your tastes, there are plenty of options to add to your breakfast for some added protein. Why not add some poached eggs with your toast, or a yogurt with your cereal? A glass of milk is also a good option, especially for the little ones who need plenty of calcium. The weather is warmer and in order to help us cool down and stay hydrated, obviously water is my go-to recommendation. I know water can be the last thing on your mind sometimes, especially if you have a sweet tooth like me, so I’ve compiled a few ideas for you to try this summer to get you feeling refreshed and also satisfying your sweet cravings! The good ole’ H2O can be made a bit more appealing, by using various fruit or even some vegetables to give it some flavour. My favourite is adding some fresh sliced lemon and lime with some mint leaves. Alternatively, you can try berries, mint alone or even cucumber! Nowadays you can even buy infuser bottles which keep your flavour foods separate to the water itself, but still giving you the fresh delicious taste. 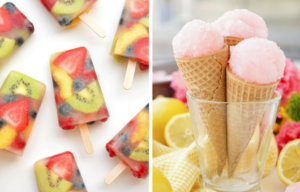 The little ice pop moulds that seem to pop everywhere over the summer months can come in really handy to have around to help you make your own delicious ice lollies. If you’re looking for a low-calorie alternative to the regular ice lollies, try making a diluted drink with mostly water and a little squash of your choice and freeze until ready to enjoy. Just be careful to read the label first, and maybe choosing a sugar-free or no added sugar brand. You can also freeze leftover smoothie in the moulds which is higher calorie but if made with yogurt and fruit, can give you plenty of micronutrients and protein. If you’re out and about, or even just want a nice treat to help you cool down, there are plenty of ice-creams and ice pops available in shops that are under 100 calories. My favourite are mini ‘Twister’ ice creams, which are available in a box of 8 and each approx. 50 calories. The full size ones are only approx. 80 calories too! For a chocolate-lover, mini ice-cream cones are fab too.. I generally purchase a box of mini chocolate cones in Aldi, again under the 100 calorie mark and give you a nice refreshing treat. Lastly, back to basics and an ice-cream sandwich can’t be beaten. Pick yourself up a packet of wafers and a block of raspberry ripple for a good old fashioned creamy treat! There are plenty of other options which I haven’t mentioned, just have a look at the labels before making your choice and you would be surprised by the difference in calories alone, many of the well-known brands consist of. This one is for the adventurous ones and even the vegans too… homemade nice-cream. As an ice-cream alternative, freezing sliced banana and then blending it with whichever flavours you enjoy, can lead to a yummy yet healthy dessert. Try adding berries, nuts, cacao, chocolate etc. and enjoy! 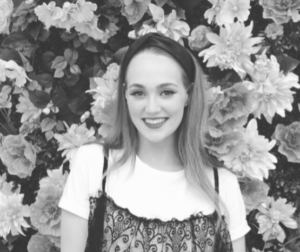 Say hello to the newest member of Team Elite, the lovely Emma Cronin! You’ll find Emma at The Kingsley studio every Sunday with her killer class plans ready to shake up your weekend! Thanks Emma for bringing so much to #TeamEliteCork. Check out Emma’s pilates journey below! 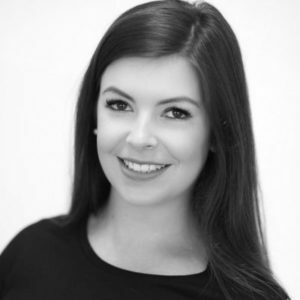 My name is Emma,I’m a digital marketeer by day and based in Dublin during the week and pilates teacher at the weekend! I started by going to mat classes in 2013 then joined Reformer in 2016 and began the mentorship program/training with Elite in September 2017. I just fell in love with Reformer and how strong it made me feel in both mind and body-why wouldn’t I want to pass that on to other people! What 3 words would you say describe Elite Pilates? I live in Dublin Monday to Friday so when I’m not in the office I like to keep myself busy. I do yoga Pilates,boxing,running,cooking and some art gallery wandering.Partial to a G+T too! Do it now, be patient and commit to it. You will be amazed at the difference in your body from attending classes consistently 2-3 times a week. Summer’s here and that means we’re hoping to brave the shorts and tank tops for the next few months, (I know we’re in Ireland but I’m being optimistic!). Whether you’ve a holiday planned or just staying local, we all want to feel confident in our skin, especially as the weather gets that bit nicer. Here, I have compiled some tips which you can implement to get your healthy lifestyle kick-started! We all know that water is important, but it is even more necessary to hydrate properly when it’s warm outside and especially when you’re sweating. Try aiming for 1-2L of water a day, more if you’re active or sweating. This can be easily achieved by carrying a reusable water bottle with you, or if you’re not a fan of the ole H2O, try mix in some fresh fruit or even mint or cucumber to mix it up! By drinking enough water, not only will your skin be massively grateful, but sometimes thirst can be mistaken for hunger, which leads to unnecessary snacking. When it comes to your nutrition, a great way to make sure you’re eating healthily and on your way to feeling more confident, is fuelling with plenty of fruit and vegetables, all various colours. By bulking your meals with more vegetables or salad, you fill up on less calories and more nutrients. This can also be adapted for snacking, a piece of fruit or maybe some veggies paired with hummus is a great way of getting your extra colours in! Exercise can be great fun, and the key is to find something you enjoy so that it becomes a hobby rather than a chore to workout. Try aiming for 30 minutes of moderate exercise a day, be it barre, Pilates, spinning, walking etc. whatever you like. Exercising helps release endorphins, which improves your mood and even boosts your energy levels. Aside from exercising, there is a term, NEAT (non-exercise activity thermogenesis), which is basically everything we do that isn’t eating, sleeping or sports-like exercise. I’m sure the majority of you have heard that we should be aiming for 10,000 steps a day, which is something we can include in our NEAT. Whether you use a pedometer, or your smartphone is doing it automatically, it makes you more aware of how much you’re walking. This can easily be upped by parking further away than usual, taking the stairs instead of an elevator, walking to the shop etc. It all adds up and is great for helping create that healthy lifestyle. Don’t forget about that sleep time. I know it often feels like there aren’t enough hours in the day, but don’t sacrifice your sleep. We should generally be aiming for 7-9 hours a night, which depends on each person. Getting enough good quality sleep is essential for your body to recover, especially if you’re exercising. Follow Jess for more nutrition tips and tricks on Facebook @JessHorganNutrition and on Instagram @jesshorgannutrition. 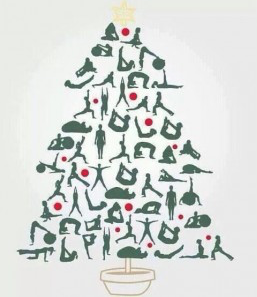 Today we are appreciating another pilates warrior, one of our amazing, loyal clients Grainne. 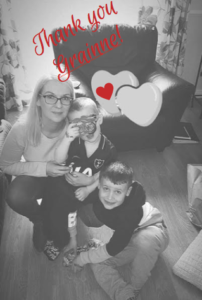 Thank you so much Grainne for choosing Elite. 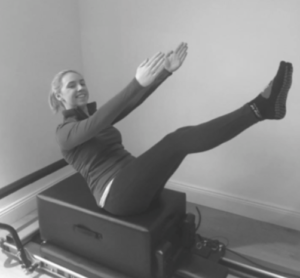 Read about Grainne’s pilates journey below. sitting at a desk, all day! I have two wee boys, aged 7 and 3.
something as much as this! How long have you been coming to Elite? barely touch my toes when I started! How did you start coming to pilates? the indulgence of the holidays, I thought it was perfect timing! What would you say is your favourite thing about Elite Pilates? love watching the instructors demonstrations! They are very inspiring. Why would you recommend Elite Pilates? flexibility of changing locations is also a great advantage. Travel – I love to travel and always thinking of my next trip away! Running after my two crazy boys…they are great fun! set with a glass (or 3) of wine! always leave with a smile on my face! I would go every day if I could! Definitely try it! You couldn’t regret it! 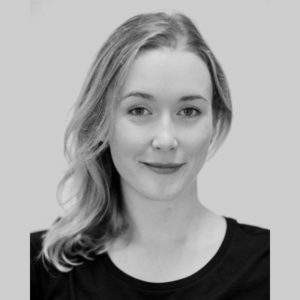 This week, we’re showing our appreciation for the lovely Jenny who is our Marketing & Corporate Memberships manager as well as reformer, barre and mat teacher here at Elite. You’ll find Jenny in any of our studios in Carrigtwohill, Donnybrook and The Kingsley Hotel. Thanks for being such an important part of #TeamEliteCork Jenny! Read about Jenny’s Pilates journey below. I’m Jenny, I’m the Marketing & Corporate Memberships Manager here at Elite and I teach reformer, mat and barre. I’m from Youghal and I’m a massive foodie and pilates obsessive. I’ve been teaching since about November 2017 and working as Marketing & Corporate Memberships manager since January 2018. I grew up practicing gymnastics competitively from the ages of 4-17 and I used to teach a little bit to kids in my local club. When I went to college, UCC didn’t have a gymnastics club and I noticed a massive difference in my strength once I stopped training. I ended up taking up pilates as a means of keeping fit and I fell in love with it. I eventually decided to do my Mat exams, then reformer, then barre and I did the mentorship programme here at Elite. I love seeing our clients progress and get stronger every class. We have so many clients who do pilates so that they can be pain free and its amazing to see how pilates can improve their quality of life. Being a part of such a great team #TeamEliteCork is also a huge bonus! It just happened really! I studied French & Italian at UCC thinking I would go on to work in translation. I loved my undergrad and still love speaking and reading in French and Italian, but at the end of my degree I realised that a career in translation just wasn’t for me. I wanted a more social, client-facing role. I always had an interest in business so I decided to do a Masters in Marketing & Management. Once I graduated from this I worked in marketing for a year and during this time I started my education as a pilates instructor. Once I started teaching I was working my 9-5 and then teaching in the evenings. Once the opportunity to up my teaching hours and work as marketing manager for Elite Pilates came up I couldn’t say no! Pilates for obvious reasons! When I’m not teaching I love jumping on the reformer and getting my own practice in. Food. I’m a huge foodie, I have to cook everyday! I love cooking healthy versions of favourites. If I’m not cooking I like to be out and about wining and dining! Travel. I’m a huge italo/francophile and I love immersing myself in new cultures. I try to travel as often as I can. I’m hugely family oriented and I’m lucky enough to have the best bunch of friends, so when I’m not in studio I try to spend as much time with them as possible. I’ll usually be found in the kitchen trying some weird and wonderful recipe and I love to travel as much as I can whether it’s in Ireland or further afield. I really don’t think that there is any body that couldn’t benefit from pilates. Whether you’re a complete new comer to fitness or if you train 6 days a week, pilates offers something for everybody. Give it a go, you won’t regret it! We’ve said it before and we’ll say it again, we are the luckiest to have such amazing, passionate and strong members who make our jobs so much fun! 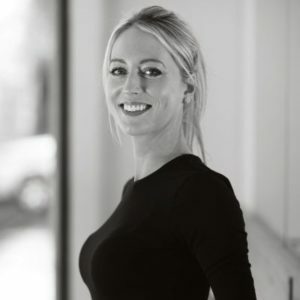 Meet the lovely Rachel Crowley and read about her pilates journey here. The thing that popped straight into my head when asked this question: Chocolate lover!! I am also very family orientated and love to go for a walk in the long summer evenings. I suffered with back pain for a few years and I was sick of taking medication to ease it. My doctor recommended to try Pilates and I haven’t taken any medication since I started with Elite. Each exercise can be tailored to the persons ability and moves are always done to ensure safety in the body. It’s a fun way to increase muscle strength! And the instructors are always lovely and helpful. My job as a pharmacy technician- I am always looking for ways up skill and to learn more. As I recently just got a new puppy, Bailey, my time is filled by walking her and training her to sit and stay! She hasn’t quite mastered them yet but knows how to get to the top of the stairs in a flash if my back is turned for a second! It’s for men and women of every age who all want to take that first step! After the intro class you will definitely want to come back for more! They offer great class packages so you’re always getting a good deal! This week, our lovely Dori Tallent celebrates her 1 year anniversary as a part of Team Elite and we couldn’t be happier to have her with us for the past year! 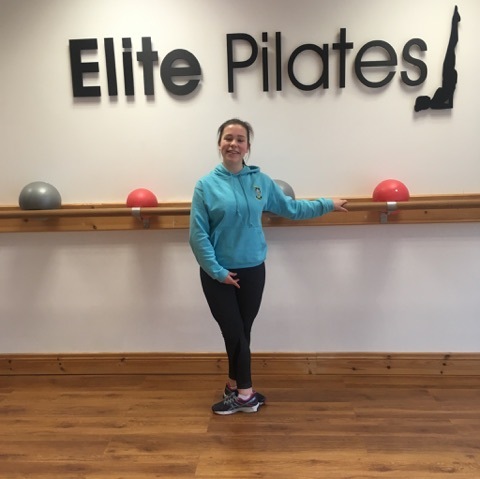 You’ll usually find Dori in our Carrigtwohill studio being an absolute pilates hero, and if you havn’t had a chance to pop into one of her classes yet, trust us, you should! Thanks so much Dori for all of your hard work as a member of #TeamEliteCork and for always bringing the very best to each and every class. Read about Dori’s pilates journey below! So I’m Dori, I’m from Kilkenny. I lived in Dublin for 4 years, the UK for 5 years, travelled for one year and have been living in Cork for 2 years. I’m a chemical engineer and, like most people, moved away to get a job. I danced all through school and loved it. I tried several different places after I left school but nothing seemed right which brought me to pilates. I’ve been working with Elite for 1 year. As mentioned I loved dance and as I missed that. Pilates pulled me in with its precise movements and body awareness, as well as the fun of barre! Working with a great group of interesting people which such diverse backgrounds. I love to make a positive difference in people’s lives. When people come in saying how they’re able to move around with more ease and not in pain anymore if they were before. I try to be honest, empathetic and frank. I love the sea, dance, and learning new things. When I’m not working my other job I try to see my family and friends as much as I can. Listen to your body, what’s right for someone else may not be right for you. This week is Member Appreciation Week at Elite Pilates and we are focusing on how lucky we are to have all of our wonderful, strong, determined members who are the heart of everything we do here at Elite Pilates. We would be nothing without our clients, and we want to share some of their pilates journeys with you! The lovely Hilary Walsh is a loyal barre and reformer client and here is her pilates journey. Tell us a little but about yourself? I’m 33, I live in Ballincollig and I’m on a major health kick this year in preparation for my wedding in November! I started at Elite last September and I haven’t looked back! A friend of mine wanted to try it as she heard reformer pilates was how Holly Willoughby lost a stone and toned up after her last baby! I came along to try it and I was hooked instantly! I’ve lost over a stone since I started so I’m living proof of the weight loss claims! The instructors are all so friendly and knowledgeable but they all have their own style of teaching so no matter whose class you’re in, you know it’ll be a different workout each time. I also love the different range of classes – I started doing reformer but kept seeing people coming out of barre class looking like they’d had an exhausting workout so I tried it and now I’m doing that regularly as well! I saw an improvement in my muscle tone very quickly (literally within the first couple of weeks!) and my flexibility has massively improved. My core is the strongest it has ever been and this has helped me with my running. I’m not the most athletic person in the world, I’ve always struggled to stick at exercise regimes but pilates has just given me so much confidence in what I’m capable of doing and in what I can achieve. – My family & friends – because no man (or woman) is an island! – My fiancé because he keeps me sane! – Staying fit and healthy – this may sound an unusual passion but I’m a firm believer that our health is our wealth and Pilates has definitely reaffirmed this for me. Pilates has benefitted my physical and mental health – I cannot recommend it enough. Working (like most people! ), with my family, relaxing, spending time with friends and running the odd 5k! Stop thinking about it and do it! My only regret is that I didn’t take it up 10 years ago! There’s no denying that sometimes we all need a little coaxing when it comes to exercise, but we’ve found a way that you can have your cake (or pizza) and eat it too with our Pilates & Prosecco event! After the roaring success of our very first Pilates & Prosecco party, we are delighted to be hosting Pilates & Prosecco Part 2 on May 11th in the heart of the city at Republic of Work. Weekends are for having fun and indulging a little, but we often end up with a good dose of guilt along with our Sunday night blues. To combat this, we decided to kickstart our weekend with a tough workout, a serious giggle, and a little fizz post work on a Friday night and it turns out you guys loved it just as much as we did! So what’s all of the fuss about? Grab your bestie or your work pals, come along to our gorgeous venue on the South Mall and work up a sweat with a 70 minute fusion class incorporating barre (yes, that one that your favourite Victorias Secret models do), Classical Mat Pilates, and of course finishing with a gorgeous stretch to get you nice an limber, ready to put on your dancing shoes for the weekend! We might even sprinkle in a few prizes (vampire facial anyone?) for our champion plank-ers or best teaser!After lots of pulsing and shaking, relax and enjoy a few laughs, a glass of fizz, and a slice of pizza while you catch your breath! With multiple instructors teaching and actively engaging in class to make sure that everyone is nice and safe, Pilates & Prosecco is accessible to absolutely every level of fitness, whether you’re a fitness newbie or a seasoned pro. And what did they say about the class? So grab your tickets here now! Tickets are €30 per person and get ready for the best workout ever! Get an extra peek into Pilates & Prosecco part 1 here! If you’ve been in any of our studios, you will already know that we have the best team ever! How lucky are we? You might have met the brilliant Jacqui at our studio in Carrigtwohill or at The Kingsley, and if you have we’re sure you’ll agree that her classes are fun, effective, and just all around amazing! Thanks for being such an important part of #TeamEliteCork Jacqui. Get to know Jacqui a little better below! I’ve always been interested in health and fitness so have pursued my passions qualifying as a Chartered Physiotherapist in 2010 and have used pilates in my rehab and prehab programmes ever since. I love to travel, family is everything to me, I’m passionate about my job. I hate not being able to give something 100%. I began when working in the NHS – I wanted to use mat pilates as a rehab tool so went and trained with APPI & and am a qualified mat instructor. I became a reformer instructor in 2016 and have pre-natal mat and reformer qualifications too. Freedom to be creative in that if I wanted to move in a certain direction – work with antenatals for example, i would be supported and guided. It’s the basis of all movement – you’re core/pelvic floor is so central to all activities of daily living and exercise. I see the limbs as levers that move around a centre which needs to be strong and conditioned. If it’s not then a persons spine or limbs will carry the load and dysfunction will likely follow.It’s called your core for a reason! As a Physiotherapist I use it as a rehab tool for treating clients and as a pilates instructor I’m continually ensuring clients move safely and learn the key elements they need to progress and get stronger – while having fun!! Husband/family, exercise and travel. I’m a people person, I’m one of 10 children and need to be around people or I’m not my happiest, I’m very lucky to have 6 sisters (6 best friends). Exercise is my therapy, I always played lots of sports so when I stopped playing I found running and gym replaced the gap that competitive sport had left. I love experiencing new cultures – I would travel the world if I could – on a bike with my husband, staying in 5 star hotels preferably. Not doing anything special to be honest! Relaxing, seeing friends and family. I do love coffee and chocolate, a whiskey in a cosy pub and a long walk on a dry day (rarely happens!!) Netflix and chill of course – I should read more. Be patient, learn how to engage core and pelvic floor properly and you will find that you’re body is able for any move. Also, never compare yourself to others, we’re all too different, a good instructor will see what your normal is and allow you move and progress within your scope. Tomorrow, March 15th, marks the lovely Annett’s 2 year anniversary with us here at Elite Pilates. 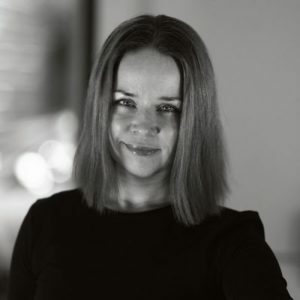 We’ve said it before and we’ll say it again, we are so lucky to have such an incredible and talented team here at Elite and we would like to thank Annett for being such an important part of it. 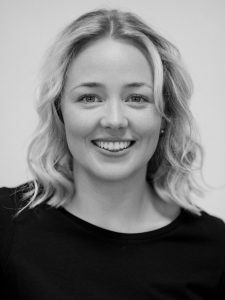 Many of you will already know Annett Brown from her killer classes at The Kingsley and Donnybrook but we thought you might like to know a little more about Annett’s personal pilates journey. Happy Anniversary Annett and thank you for everything that you do. I have a German Passport but have lived in Russia, Syria, Turkey and the UAE before moving to Ireland in 2014. I have two kids, two pets and one husband. The weather in Ireland is something I struggle with as I love sun, beach and warmth. I started teaching at Elite two years ago, time flies. I had to have back surgery for a slipped disc in my lumbar and was advised to start Pilates, that was 11 years ago. I got hooked on it and always wanted to start teaching, seeing others get better, stronger and aware of their bodies is so rewarding. A few years later, I did various Teacher Training courses with Balanced Body to qualify and upskill. The clients are amazingly fun, passionate and driven. The team is pretty special as well. Same as number 3 really, I just got hooked! Languages – I like learning languages, I can converse in German, English, Turkish and Russian and have studied Arabic, Persian and Ottoman. My background is in HR consultancy and this is still what I am doing during the daytime. I support professionals with their job applications, write CVs, provide career guidance and assess people. Additionally, I like spending time with my family. We all love animals, so horse riding is quite a big part of my kids’ lives and I run the Social Media for the Kinsale Equestrian Centres, do all the photography as well. Miracles don’t happen overnight, so stick with it and you will see the results. Also, see it as chance to get some ‘Me-time’ as you have to concentrate so much on the movements that you cannot think about shopping, etc. 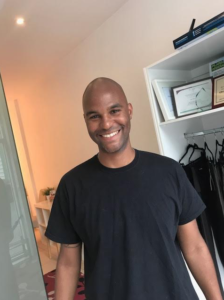 At Elite Pilates, we are so lucky to get to work with not only our amazing clients, but also with our incredible team of instructors. All of our instructors here at Elite are talented, dedicated and play a huge part in creating such a special atmosphere in all of our studios. Because we appreciate all of the hard work and passion that our teachers put in to each and every class, we want you to get to know them a little better too! 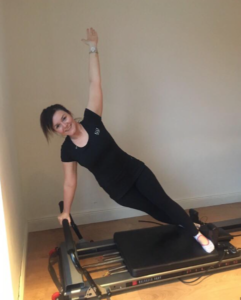 You may already know our lovely Jess Horgan from class, but if you, like us, are a little nosey, you’ll love hearing all about Jess’ own pilates journey here! I’m Jess, a foodie, nutrition nerd and Pilates instructor. I love all things wellness-related, be it sports, mindfulness or healthy treats. My love for keeping busy has led me to completing a BSc in Nutritional Sciences, diploma in nutritional therapy, national qualification in exercise and health studies.. alongside all of my Pilates qualifications! You could say that I like to take on new challenges quite often! I’ve been teaching Pilates for years but I am working with Elite for just over 2 years now.. and still love it as much as I did back then. Having suffered with a back injury for quite a while, I was after discovering how Pilates could help me improve my posture, core strength and flexibility. When I qualified as a personal trainer, I had fallen in love with Pilates so much that I decided to specialise in mat Pilates teaching. One thing led to another and I kept adding more qualifications, now being certified in mat, reformer, barre and prenatal. It’s true when they say “find a job you love and you’ll never work a day in your life”. Teaching at Elite Pilates never feels like work, it’s a hobby that I love, which also happens to be my job. The whole of Team Elite make working here a great experience as everyone is passionate about what they do, and that is something thats definitely required in the job. Getting to meet so many people who I can help form their love of Pilates is a huge benefit also, after teaching a class, it’s as if I have absorbed all of their energy and I leave on a high. I didn’t really choose Pilates as a career, it just sort of found me instead. I have also been into exercise and healthy eating, so having studied about the human body for four years in university, gave me a great foundation to start my Pilates career. I am still a passionate nutritionist, which luckily for me works hand in hand with my Pilates journey. Firstly, I think Pilates has to be mentioned, my passion for that has just multiplied for the past number of years. The benefits of Pilates are amazing and I will always be grateful for how it improved my body and also gave me a career that I love. Secondly, nutrition and healthy eating. I’m all about balance, you’ll find me with a pizza one night and at the farmers market with a salad and raw treats the next day. I believe that everything you eat should be enjoyed, and for that reason, I’m all for the 80:20 rule and no diets. Lastly, I’m passionate about learning and I’m a huge advocate for continued education and professional development. I believe that the more you learn, the less you know.. and therefore I’m constantly looking to better myself and learn from others. When I’m not at the studio teaching or doing my own workout, I’m still practicing what I preach. I go to the gym for a resistance session or a spin class, out walking or as I previously mentioned.. at the farmers market. I still continue to have at least one course on the go at a time, be it online or in the evening, I love keeping my mind active and progressing my skills. It’s important for me that I keep on top of the latest research in nutrition, and to discover new Pilates moves and techniques. I also love to bake, mainly substituting healthy ingredients into my favourite recipes, especially something sweet to have with a mid-morning coffee! As we say in Elite, Pilates is for every body. Everyone can benefit from Pilates, and I would highly recommend trying a couple of classes to really get into it and see the benefits for yourself.